Bloodstorm and Gambit are breaking into a facility of Apocalypse for Gambit’s mysterious client. Bloodstorm has kept hidden from Gambit the fact that she’s a vampire. When they break in they meet the Fallen (Angel/Archangel/Warren Worthington III) he tricks them into thinking he’s injured and he forces storm to transform to mist revealing to her friend that she’s a vampire. Him and the horsemen attack and our duo flee. Bloodstorm calls forth rats, wolves and bats to hold off their attackers while they search for the ‘prize” they seek. Ororo recounts how she became a vampire as he opens the main lock. They retrieve two babies and the horsemen attack again. Gambit is mortally wounded and begs Bloodstorm to ‘turn’ him. She does and they make their escape. They re-goup in a graveyard where the thirst calls Remy to kill the children. He lashes out at storm for turning him and runs off. He meets up with members of the assassin’s guild and feeds on her. Sated he returns to the graveyard before dawn. He takes the children inside a tomb and sleeps till night, Bloodstorm leaves for parts unknown. That night sinister comes for the children he decides to take the boy and kill the girl but Gambit stops him by using his new powers. Sinister allows him to keep the girl though he may reclaim her later. In his lab he force grows the boy to puberty. Art was very colorful and vibrant contrasting with the macabre vampire tale that it told. Cover- This cover shows a devastatingly beautiful Bloodstorm with Gambit. This is easily my favorite rendition of Bloodstorm. 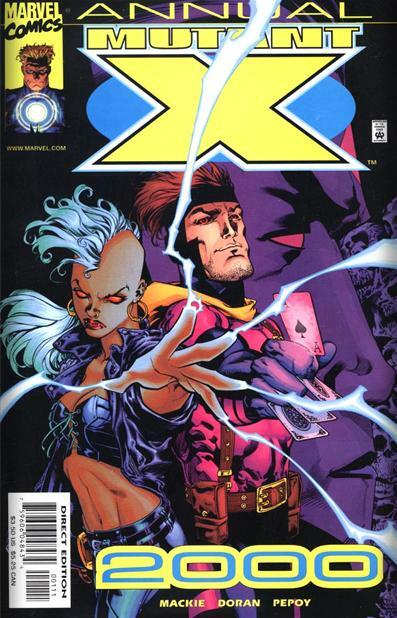 Story- This story fills in the gaps of how Gambit became a vampire in the main Mutant X series and also explains his relationship to Bloodstorm. The children introduced in this tale also play a major role in issues following in the mutant x universe. It was rather lackluster for this alternate universe which started out so well to just suddenly become so similar to 616 continuity (mainstream marvel) Gambit working for sinister, growing Nate Grey etc It was all contrived and boring.